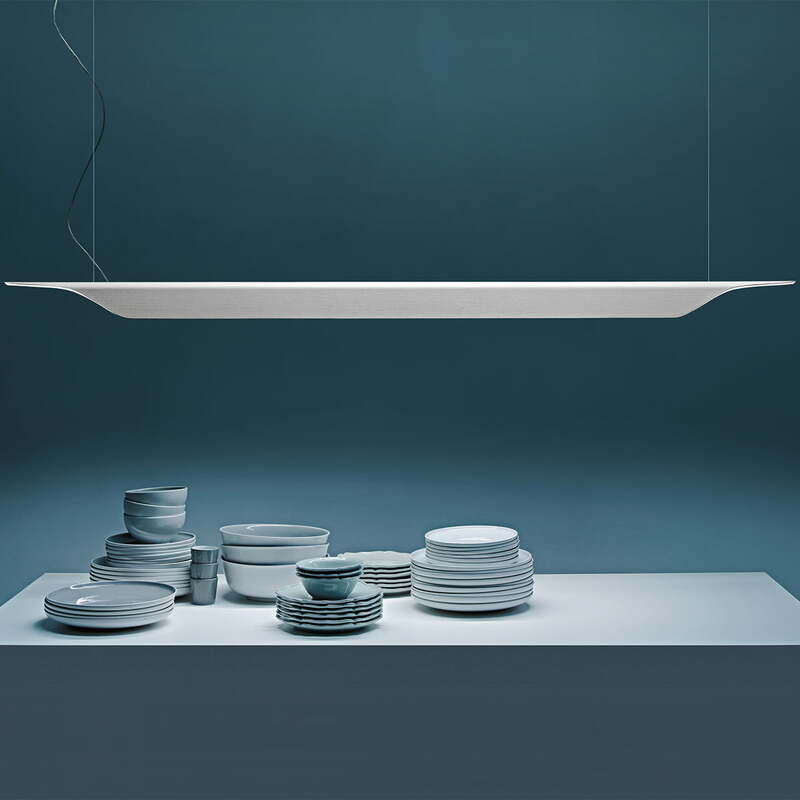 The Troag pendant lamp is a linear floating, charming lamp by Foscarini. The designer Luca Nichetto was inspired by canoe shaped wooden bowls according to Swedish tradition and put his idea into practice with the help of special millings on the edges. Even with the material, he kept to his model and produced the light in curved plywood in various colours. The elongated shape allows an optimal use of light as the light illuminates spacious underlying tables or working surfaces evenly and directly. A diffuser made of warm moulded plywood, whose edges have a special milling and 5 axes, as well as an inner diffuser made of extruded matt PMMA enable a pleasant lighting situation. In addition to the direct light downwards, the light is also emitted light upwards through two slots. A shade inside the wooden housing makes the bulb invisible and hides also technical elements stylishly. The slender lamp is attached to the ceiling by two suspension cables made of stainless steel with mechanical fixings, which are adjustable in height. A ceiling rose with frame made of galvanised metal and a cladding of solid-coloured plastic complete the design. The light presents itself in an unconventional and original way, floating in the center of a room and thus becomes a real eye catcher. 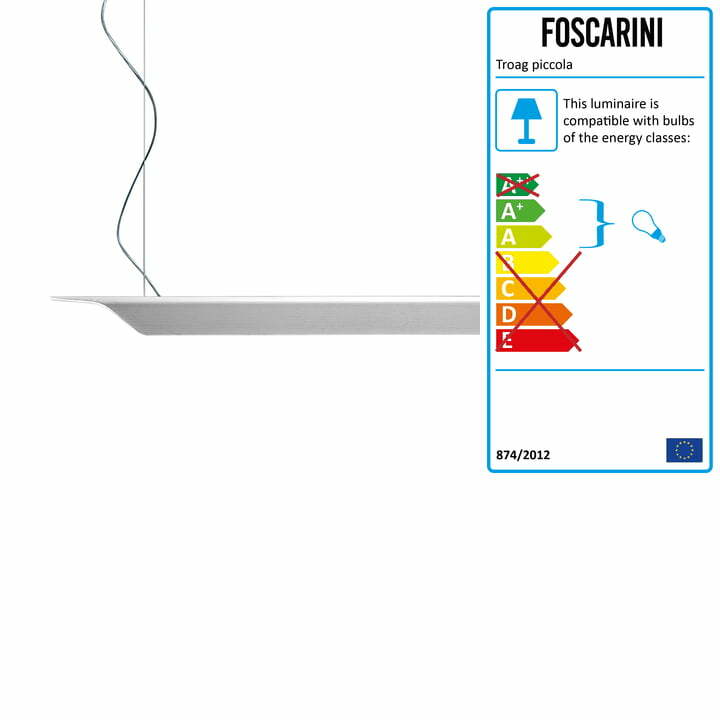 Upon request the Foscarini lamp is available in other sizes and colours. 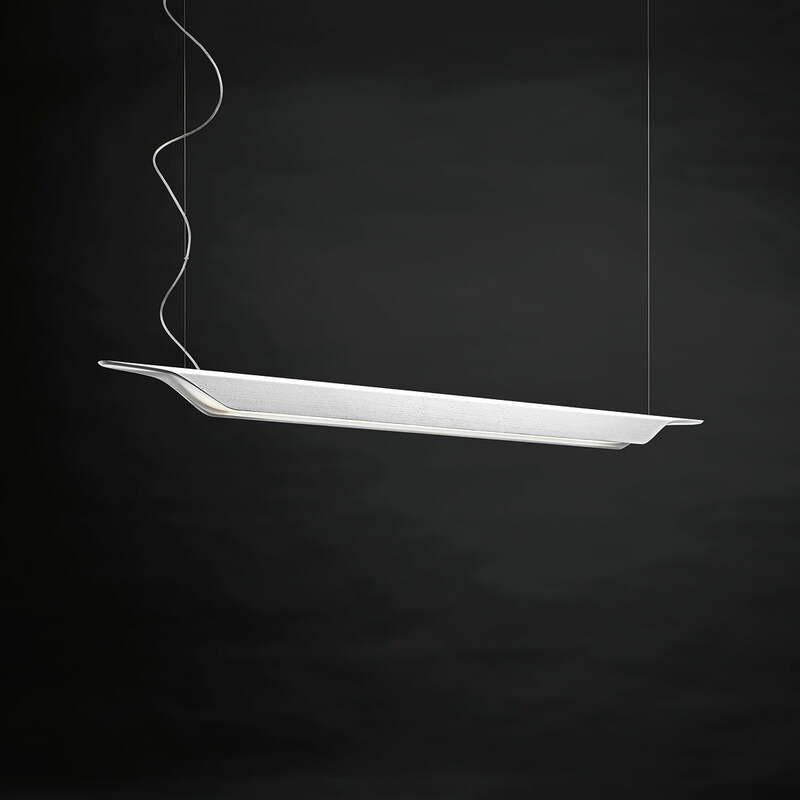 Individual image of the Troag Suspension Lamp. The long form is reminiscent of a canoe and is also made of wood. This is also the inspiration of the designer Luca Nichetto. 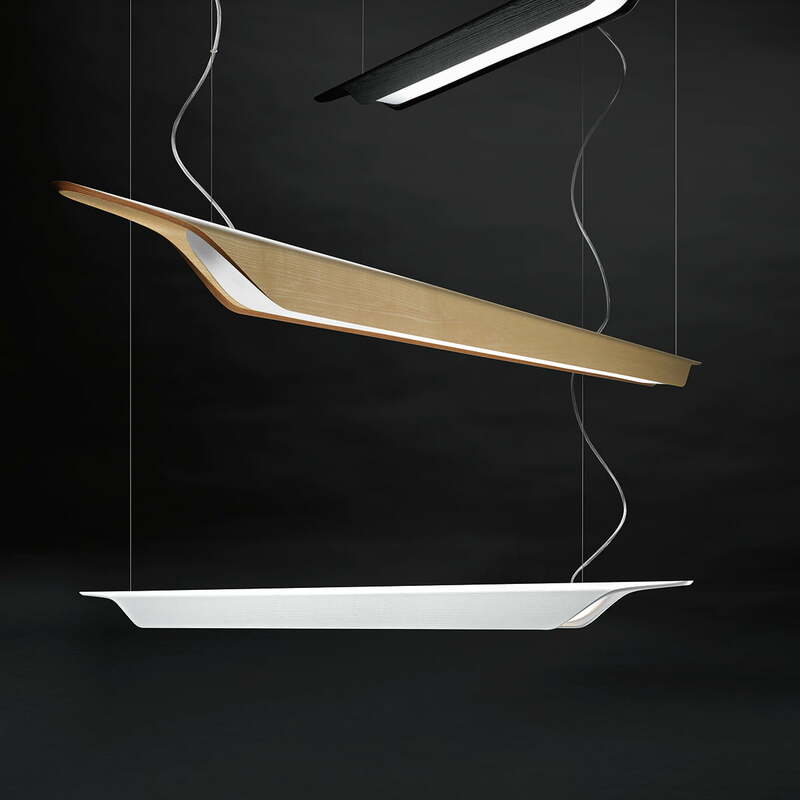 Group image of the Troag pendant lamp. Thanks to the adjustable suspension, the luminaire can be combined, so that it can be installed on top of each other in a row. 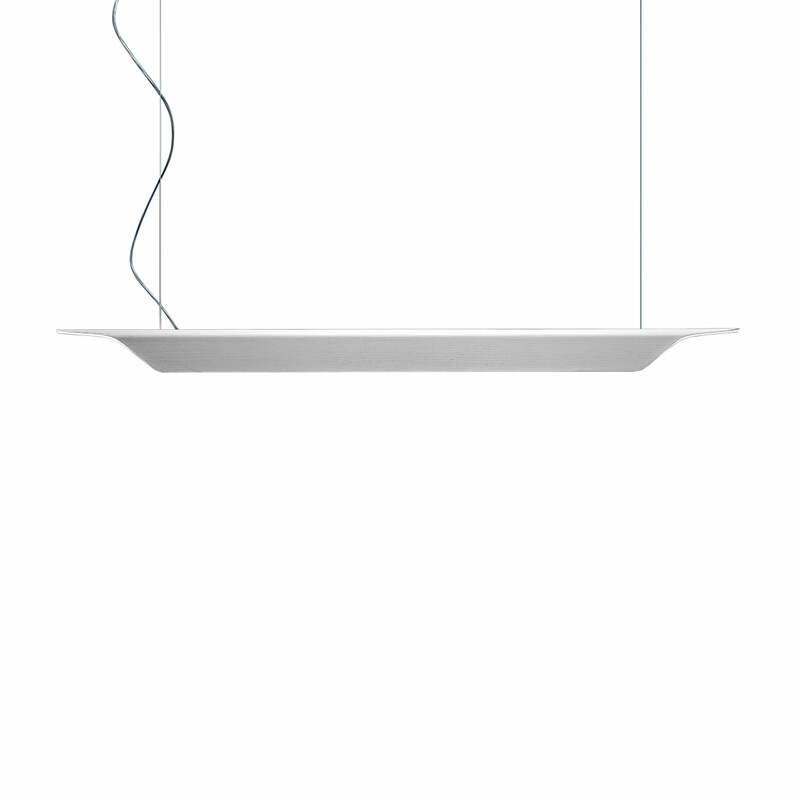 Ambience image of the Troag pendant lamp. The lamp by Foscarini presents itself unconventional and gracefully and impresses with the long, space encompassing shape. 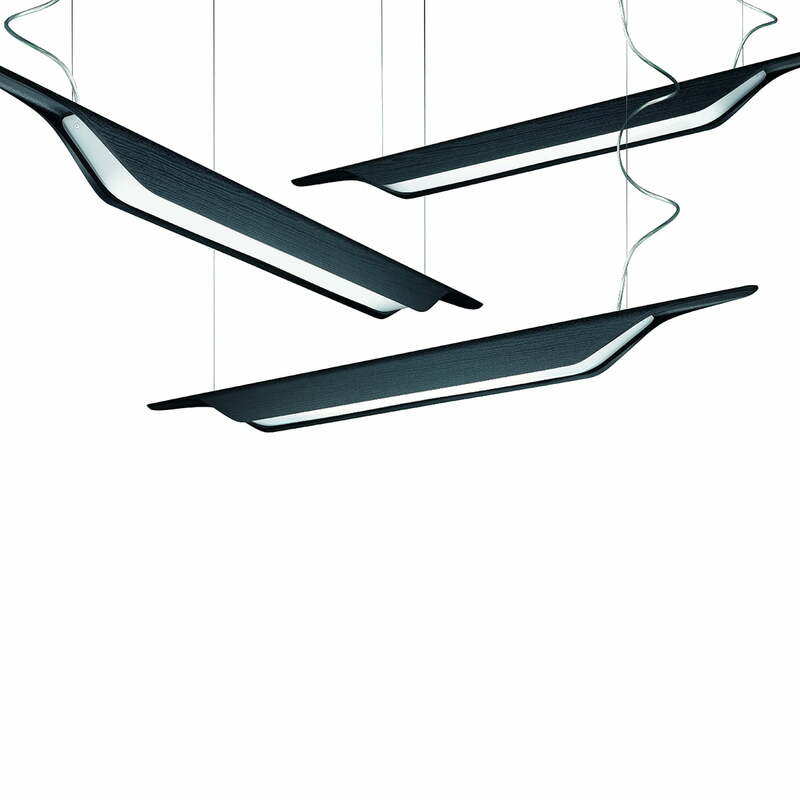 Ambience image of the Troag pendant lamp by Foscarini. Thanks to the downwards directed light, dining tables and working desks are illuminated perfectly. 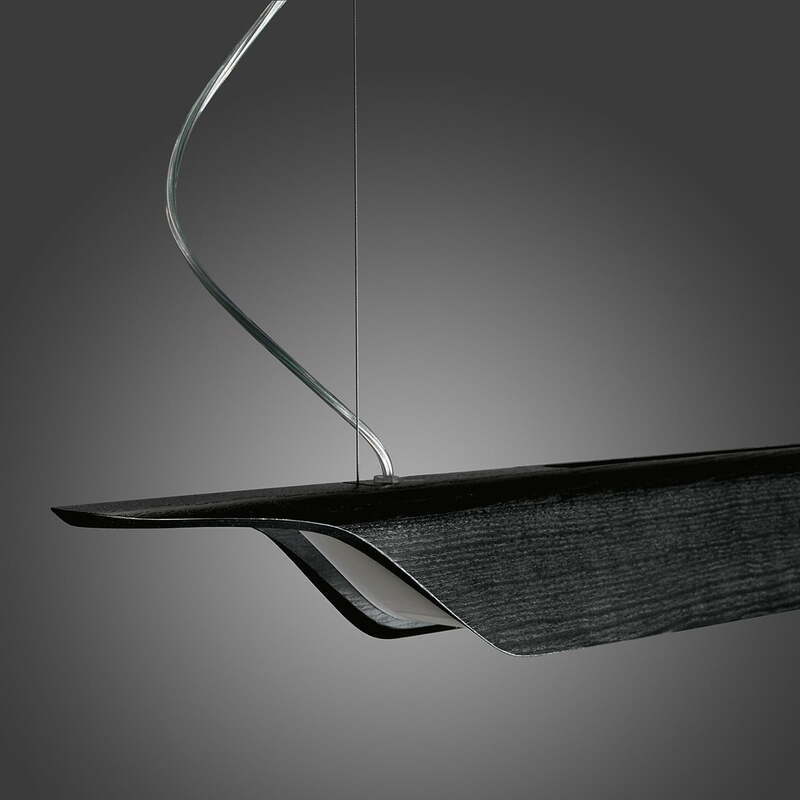 Detail view of the Troag pendant lamp. The special milling ensures the exceptional shape. The wood grain of the multi-layered material is also clearly visible. Group image of the Troag pendant lamp. Especially large, high rooms are perfect to combine further copies of the lights and thus create a real eye-catcher.